The Yuletide Season is fast approaching. And now is the perfect time to buy your Christmas gifts to avoid the holiday rush. 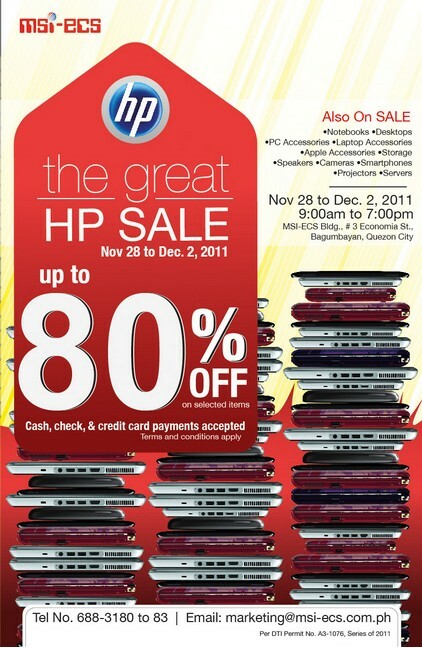 If you're on the market for laptops and other computer accessories, MSI-ECS is once again holding a warehouse sale on November 28 to December 2, 2011, from 8:30 am to 7:00 pm, at the MSI-ECS Bldg., # 3 Economia St. Bagumbayan, Quezon City. With items up to 80% off, you’ll never run out of good bargains. Although discounted laptops are limited to the HP brand, there are other participating brands for accessories and other gadgets including Acer projectors, Microsoft hardware, Genius peripherals, Imation storage, Belkin iPod/iPad accessories. Be sure to come to the warehouse sale early as there are thousands of excited buyers like you looking to grab the best deals. Check out the pricelist now and see our year-ender savers via this link.